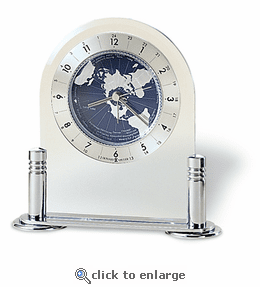 Tabletop alarm clock displays a revolving world map accented with deep blue oceans and silvertone continents. Polished silvertone metal columns and base support the beveled arch. Felt bottom protects your desktop. Quartz alarm movement includes the battery. As a special offer, we will add up to three lines of engraving at no additional charge. Engraveable items require extended production time. Approximately 6.25"x6.25"x1.75". Expertly crafted by Howard Miller.